UFlex Athletics® has combined the newest 3D technology with high quality materials to produce the ultimate sporting equipment for women, men and kids. This fashionable and stylish Elastic Knee Compression Sleeve Support with a 4 way stretch capability, offering all around superior protection is a must have for runners, weightlifters, or professional athletes. Key Features:Optimal compression grade to improve muscular endurance, protect the knees and promotes faster muscular recovery. Can offer pain relief and moderate support in minor or incipient knee illnesses like: runners and jumpers knee, arthritis, tendonitis, however this is NOT a medical device and will not treat the above knee injuries. Has a DOUBLE silicone anti-slip wave that provides the best grip so you won’t have to readjust it during gym time, squats, weightlifting, yoga & dance, marathons, fitness or gymnastics. It doesn't roll, slide or slip down. ​ Ultra Lightweight : professional grade material (nylon & lycra blend). Designed for all day comfort, flexibility and ultra-durability. Click the Link Below to Receive Our PREMIUM Product! We’re so confident in the quality of our knee wraps that we offer a 30 days money back guarantee . Contact us if you have any issues or questions and we will be able to exchange or refund the order! Optimal compression grade to improve muscular endurance and protect the knees, reduces inflammation and swelling, prevents blood pooling, stimulates blood flow and promotes faster muscular recovery. Can offer pain relief and moderate support in minor or incipient knee illnesses like: runners and jumpers knee, meniscus tears, arthritis, tendonitis and osteoarthritis, however this is not a medical device and will not treat the above knee injuries. Ultra Lightweight: professional grade material (nylon & lycra blend). Designed for all day comfort, flexibility and ultra-durability. As an athlete and coach I only recommend and endorse products that I have used and am extremely happy with. In 2017 I had 3 knee surgeries and wanted to try the sleeve on my left knee to help me recover from knee micro fracture surgery. I love the compression that the sleeve provides and it is also very comfortable to wear. It is also thin enough to wear under jeans and other clothing. I use it to walk, run, play golf and more. I absolutely love the support the sleeve provides my knee and think the cost is extremely reasonable. 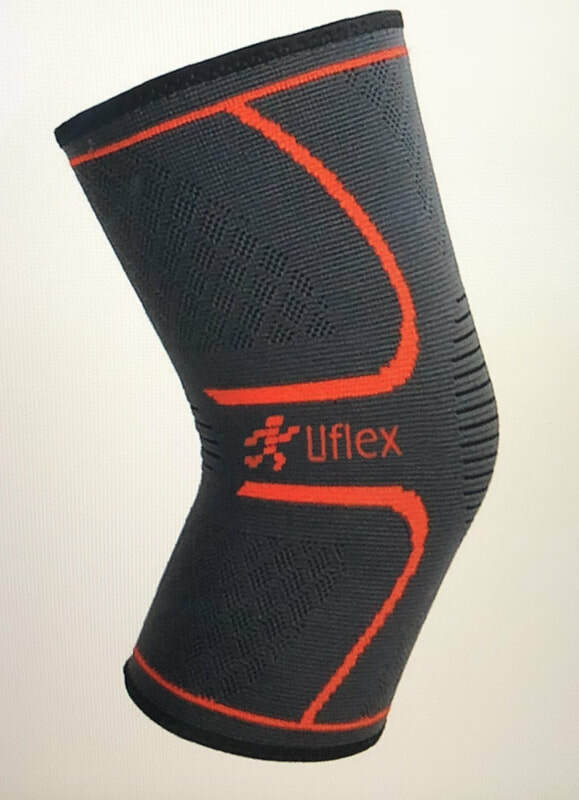 ​The fourth item mentioned was the Uflex Athletics Knee Compression Sleeve. The article states, "Compression garments, as the name suggests, are designed to fit tightly enough to compress the skin, and so promote blood flow. One 2015 study in the journal Physiotherapy found compression sleeves can be an effective treatment against knee pain. That study also found compression sleeves can stabilize knee joints—another bulwark against pain and possible injury." “This sleeve has helped me be able to run again without sharp pain in my knee,” writes one buyer.